If you are looking to get fit, stay healthy or just maintain your current fitness levels then you are in the right place. 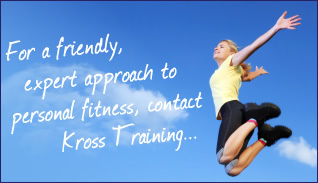 Kross Training has been developed by Kevin Cross who is a fully qualified and insured personal trainer offering a range of personal and group training sessions and swimming lessons. Kevin�s primary aim is to provide fun and effective exercise tailored to your individual needs. Sessions can be held wherever you feel most comfortable, whether that be in your own home or in the outdoor environment and we can cater for all ages and all abilities. Whether you are young or old, male or female Kross Training will create a programme specific to your needs. Based in King's Lynn, Norfolk, Kross Training can cater for anybody looking to reach their physical goals no matter what they are. Understanding that everybody has individual aims, capabilities and aspirations, Kross Training has adopted the motto 'for your body, not everybody'. "To motivate and guide individuals to achieve their personal health, fitness and sporting goals through advanced exercise knowledge, sound nutritional advice and effective exercise programming and to bring professionalism, dedication and positivity to the pursuit and maintenance of sports performance, health, fitness and wellbeing."